If you see these aliens, call the authorities immediately. 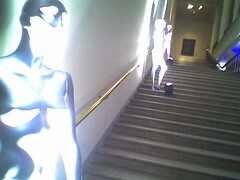 Strange silver mannequins occupied the Minneapolis Institue of Arts tonight, apparently an homage to Metropolis. Aside from some blue cocktails, blueberry tarts and peculiar blue and white popcorn balls, the main reason for going was the Beauford Delaney exhibit. It ends February 20, so get ye to the MIA! Self-Portrait, 1944 is a favorite of mine. Here are more selected paintings. I dig the new Chem Bros. Esp. the "Galvanize", "The Boxer" and "Marvo Ging." What does the rest of Kings Of Convenience sound like? That "rather dance with you" song on The Current bugs me. The new Daft Punk is not so good. Lots of cool sound, but damn little of it crafted into actual song structure. How is the Lemon Jelly 64-95 disc? I've been really enjoying the songs heard on KCMP. I listened to it twice while I was working (i.e. not paying attention) and certainly enjoyed it. That sounds so white, doesn't it? "I certainly enjoyed the Lemon Jelly while I was working on the computer." Also? The Daft Punk rocks dude. No song structure though, true. Yes, the fat synth grooves of Daft Punk rock. But "Robot Rock", for example, does the same thing for 5 minutes. No nuthin to it but the hook. "Technologic" is better, though. I keep coming back to that one. Technologic is funny. I also like "Television Rules the Nation" but yeah, once it gets going it never changes. Daft Punk's finest hour was "Digital Love" in my book.